With some crucial changes in this year’s driver-team pairings, the 2019 World Rally Championship couldn’t have started on a more exciting and thrilling note. 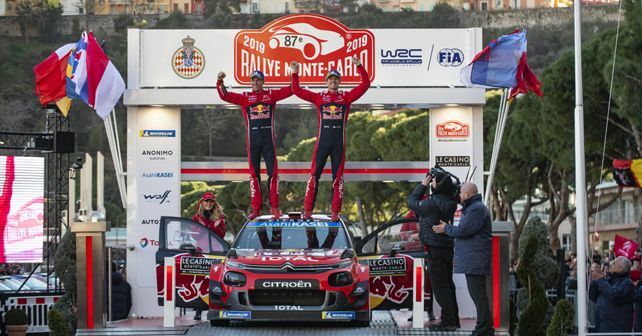 Kicking off the 2019 season in style, defending champion Sebastien Ogier, along with co-driver Julien Ingrassia (Citroen Total WRT), overcame late drama to clinch his sixth consecutive Rallye Monte Carlo victory. The spellbinding final stage bore witness to one of the closest finishes in history, as Ogier fended off Belgian rally champ Thierry Neuville and Nicolas Gilsoul (Hyundai Shell Mobis WRT) by a thin margin of just 2.2 seconds for a debut win on his return to Citroen. The win proved to be all the more special as it marked the French manufacturer’s 100th world rally success. However, while Ogier secured a win, it wasn’t easy sailing for him, as he was hampered by a throttle sensor problem on his C3 World Rally Car throughout the final leg, which allowed Neuville to claw back a 4.3 second overnight deficit in his i20 to trail Ogier by just 0.4 of a second before starting the final speed test. At one point, Neuville had snatched the lead from Ogier but an overshoot on the second day cost him nearly 15 seconds and, in retrospect, the victory. After claiming his seventh Monte Carlo win in total, with four different manufacturers, Ogier said, ‘It's the rally I want to win the most in the season, that's why I'm so happy now. It was tough in the last leg because we had a problem with a sticking throttle, which was pushing the car when I was on the brakes. Six years in a row with three different cars – that’s not so bad!’ he added. While Neuville claimed the second spot, Ott Tanak and Martin Jarveoja (Toyota Gazoo Racing WRT) claimed the final spot on the podium in their Yaris World Rally Car. Behind Tanak, Sebastien Loeb & Daniel Elena (Hyundai Shell Mobis WRT) and Jari-Matti Latvala & Miikka Anttila (Toyota Gazoo Racing WRT) finished in fourth and fifth, respectively, split by just 1.7 seconds.